The high Volume of business in the Louisiana area makes tuckers have to know their way around the state. 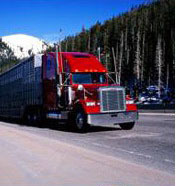 The discount freight shipping service in the area is wide, fast, and growing daily. With our wide range of carriers in this area, we can offer freight shipping discounts and still offer the customer a way to save more money. If your Louisiana shipment is point of origin or a destination point we are ready to save you money. All requests for discount freight shipping quotes are welcome. Our dedication to our customer is second to none. Old Glory Freight respects your privacy and does not share your personal info with anyone.